On What Part of the Body Does Hair Grow the Fastest on a Normal Man's Body? Men grow hair on many areas of the body, but the area with the fastest growing hair is on the face. In particular, the area on which a man grows a beard contains the hair that grows fastest on his body, and likely necessitates daily shaving if he does not keep a beard. Hair growth rates can vary from person to person, but typically facial hair is the fastest growing, though certain hair growth disorders could affect that. Hair grows at different rates all over the human body. Facial hair on a man grows exceptionally quickly, however, and outpaces all the other areas on his body. Estimates predict that facial hair in the beard region of an adult male can grow 0.4 millimeters per day. This may not seem very fast, but if a man never cut his beard in his lifetime, it could grow to be over 30 feet long! During the development of a specific hair follicle, there are three phases of growth. The first is the catagen phase, in which the hair is rooting itself into your skin and there is no detectable growth. The second is the telogen phase, which is also a resting phase and lasts for about 100 days for hair on your head. The final phase is anagen phase, during which the hair follicle really grows. It can last for years, until the hair falls out, and is the most variable phase in different men. When growing out a beard, men must keep the fast rate of beard growth in mind. Since men's facial hair grows so quickly, it necessitates daily attention for well-groomed care. Trimming edges, cleaning out thickness and maintaining a reasonable length of the beard are all key parts of beard care, and all are affected by the overall speed of facial hair growth. The practical benefits to men's facial hair growing so quickly are potentially numerous. One obvious reason is that men who live in colder climates can grow this hair to keep the face warmer. 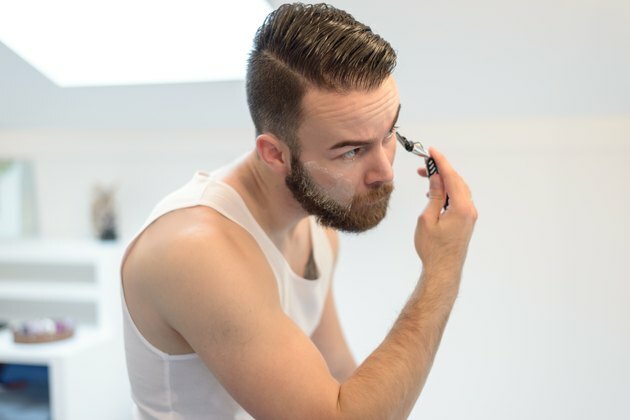 On a more personal side, many men can choose to hide skin or facial imperfections or to balance out their facial appearance by growing a beard. There are a number of hair growth disorders that can affect the rate of hair growth in people. One example is hypertrichosis. Hypertrichosis is a medical condition that can affect men and women, and is characterized by excessive hair growth in areas that normally don't grow hair. In men with hypertrichosis, the fastest growing hair may not be facial hair, though facial hair growth rate will continue to be very rapid compared to other men. Healthy Living Answers: What Makes Hair Grow?